Thirty hopeful players are in Florida this week, for the USA National Team Selection trials, vying for a spot on the 2019 USA National team, which will compete at the 2019 WBSC World Championship in Prague, Czech Republic, and Lima, Peru, at the Pan American Games. Kevin Castillo, Long Beach, Calif.
Ryker Zane Chason, Alma, Ga.
Joel Cooley, St. Paul, Minn.
Yusef Davis, Long Beach, Calif.
Tyler Dudley, Battle Creek, Mich.
Jon Gwizdala, Bay City, Mich.
Peyton Hall, Prairie du Chien, Wis.
Jonathan Lynch, Cape Girardeau, Mo. Tony Mancha, Las Cruces, N.M.
Blaine Milheim, Eaton Rapids, Mich.
Nick Mullins, Toms River, N.J.
Zac Shaw, Bates City, Mo. Marcus Tan, Union City, Calif.
Chase Turner, San Jose, Calif.
Click here to visit the official USA Softball team page, including photos of the players listed above. Yusef Davis, Jr. of Long Beach, California is among those in Florida this week, competing for a spot on the 2019 USA squad. 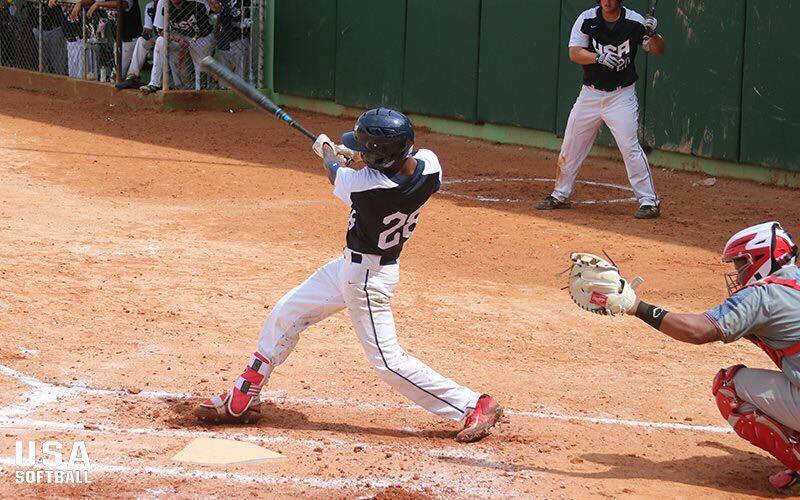 Yusef arrived quickly onto the international stage in 2017, homering in a key game against Canada, in the Pan Ams in the Dominican Republic. The win helped the USA win bronze medals at the competition, and earn a spot in this year’s Pan Ams at Lima, Peru. Yusef got his start in the game, as a city league teammate of USA veteran Kevin Castillo, who will also be at the camp. Koert? Turner? Do they still play? Was just told yesterday that the Shaw and Hall kids will be stars. Florida…where? I’m there, could be interesting to see. Late reply, Dirk, but it was Clearwater.